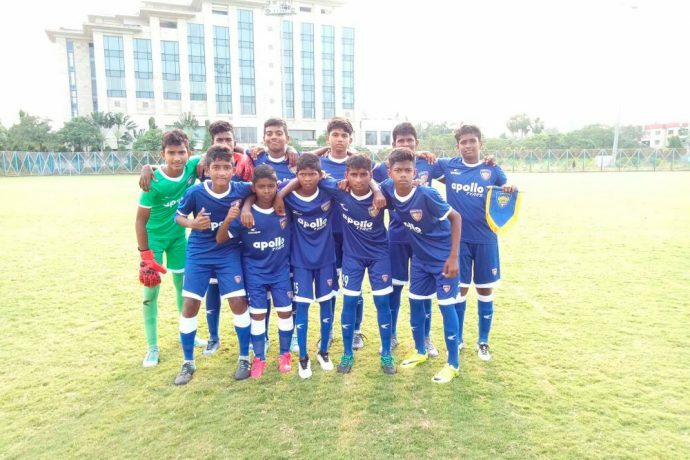 The Chennaiyin FC Under 13 team concluded their Under 13 National Youth League final round campaign with a 6-0 defeat against SAI Kolkata at the Vivekananda Yuba Bharati Krirangan (VYBK) Practice Ground here today. The result brought to an end the CFC U-13 boys’ first experience at the national stage in their debut season, providing a big learning curve in facing teams from all around the country. There were two changes to the Chennaiyin starting lineup as suspended skipper Rahul K. was replaced by Akash M. in defence while S. Abilash came in for Teejeshwar P. in midfield. Allen Rajkumar was the Chennaiyin captain in Rahul’s absence. SAI Kolkata began the brighter of the two sides, attacking from the word go and not allowing Chennaiyin to settle down. Deservedly so, the team from Kolkata went 2-0 up within the first ten minutes through goals from Farman Ansari and Rakesh Kumar Bhuiya. And despite CFC’s best efforts, it was soon 3-0 when Debajit Roy scored on 14 minutes. All the football was being played in the Chennaiyin half, the boys in blue unable to create anything substantial as they were pushed back by a high-pressing SAI Kolkata outfit. Striker Mohamed Liyaakath was CFC’s only bright spark in the first period as he went close with a half-chance on the break, as it ended 3-0 in favour of SAI Kolkata at half-time. The Kolkata side began the second period much like the first, with Rakesh doubling his tally to make it 4-0 soon after the restart. Chennaiyin made a couple of changes in the middle of the park, introducing S. Vinay Charan and B. Haribalan to freshen things up. But SAI Kolkata proved too strong for the Chennaiyin boys, adding two quickfire goals in the closing stages through Mohamed Aziz Islam to run out 6-0 winners. This concludes the CFC U-13s’ journey in this season’s U-13 National Youth League, finishing in third place in Group C ahead of Roots Football School who were beaten 9-1 by Sudeva FC in the group’s other fixture. A squad made up entirely of boys hailing from Tamil Nadu, the exposure garnered by them in facing talent from across the country will serve as great learning. They will now aim to carry this learning into the coming season in order to continue their all-round development and improve their performances.